Tuesday morning I designated as my “Exhibit Hall Day,” mainly because I was going to be spending two hours volunteering in one of the booths. But let me step back and talk about what is an Exhibit Hall at a geology conference. Although professional conferences are filled with presentations and awards ceremonies and networking opportunities, for geoscientists, the conference Exhibit Halls are just as important for gathering new information. 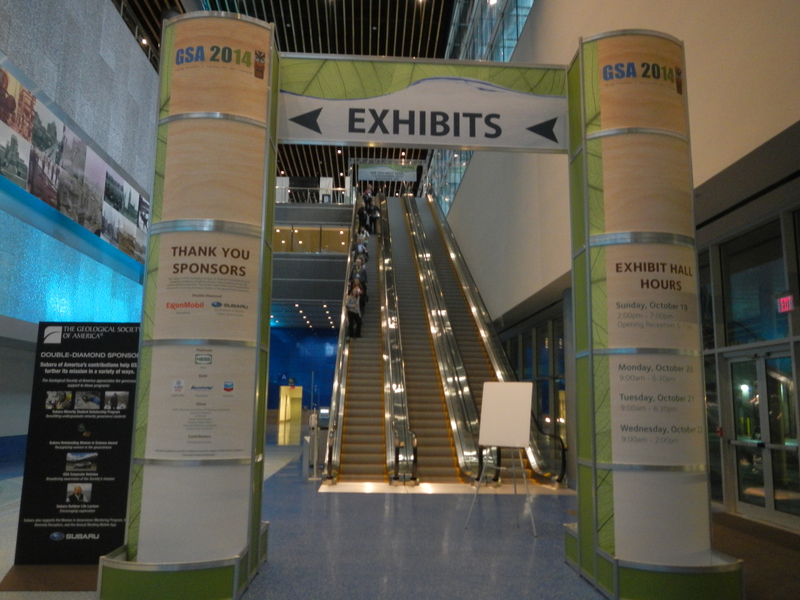 The GSA Exhibit Hall has over 200 vendors with displays for their product or organization. For example, several textbook publishers are present with copies of textbooks for all sorts of geology courses to take a look at. Other publishing companies are present with general science-themed books to purchase. Companies that sell geologic supplies to conduct labwork and fieldwork are in the Exhibit Hall, supplies such as microscopes, rock hammers, waterproof field notebooks, etc. Finally, other geological organizations have booths to promote the mission and programming of their groups, such as the American Geosciences Institute (AGI) and the Geological Society of London. Of course, I can’t forget to mention one of the main vendors and top sponsors of the conference, Subaru. 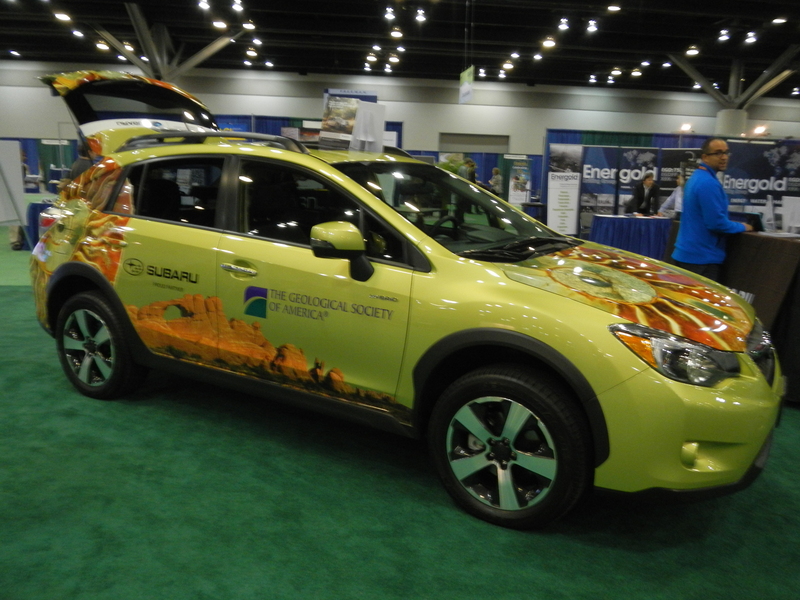 Geologists love Subaru, and Subaru loves geologists! Not only does Subaru always have their cars on display in the Exhibit Hall, they provide GSA members a discount on the purchase of a Subaru as part of the Subaru VIP Program (yes, I am proud to say I drive a Subaru!). My Subaru is not as cool looking as the one in this image, but you could say that Subaru is the “official” car of geologists. They frequently partner with the great organization Leave No Trace and use the hashtag #subarulovesscience. You have to love the geology wrap on this Subaru! 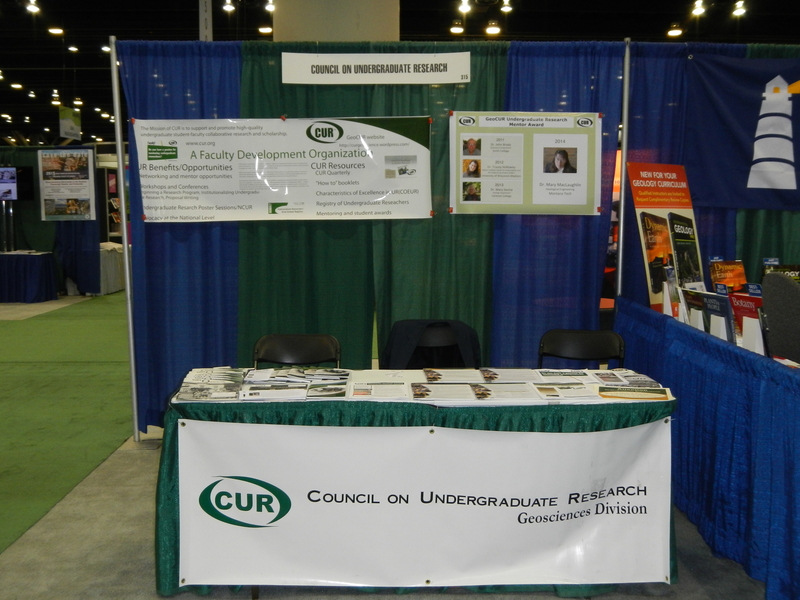 As I am one of the councilors of the Council on Undergraduate Research (CUR), I volunteer some time at each GSA meeting to work in the CUR booth to help share information about CUR and its resources for faculty. I took my first workshop with CUR when I was a graduate students at a past GSA meeting, and I have learned so much from CUR over the years, that I am thrilled to be able to pay it back and pay it forward for other new faculty that are just starting out. CUR helped me be the research mentor to students that I am today, and I can’t thank this community of faculty enough for all they have done for my professional development. Lunch is going to be a real treat – it is an awards ceremony with short talks, and then more conference activities for the afternoon. Stay tuned!